The Fishlinger Optimism Index™, a breakthrough measurement of public opinion centered on Americans’ optimism about the future from the Fishlinger Center for Public Policy Research at the College of Mount Saint Vincent fell back to 57 in March from a high of 70 in February and 61 in January ’19. Please note that the data collection was largely completed before the issuance of the Attorney General’s summary of the Mueller Report. During this period, federal policy fell from 58 to 48, national leadership fell from 54 to 51, and social progress fell from 53 to 46. Personal prosperity remained steady at 56 and world affairs rose slightly from 57 to 62. 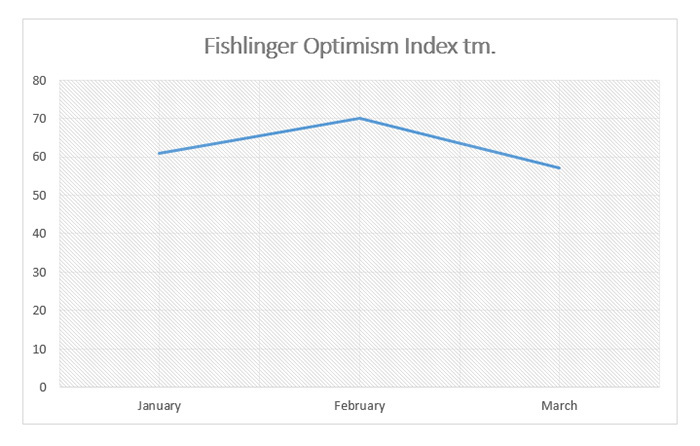 The Fishlinger Optimism Index™ is more than an economic measurement. It is built on opinion data for public officials, social/political issues, beliefs about the United States’ place in the world, and a series of value statements dealing with individuals’ feelings of success and security, as well as from ratings of government policies and officials. 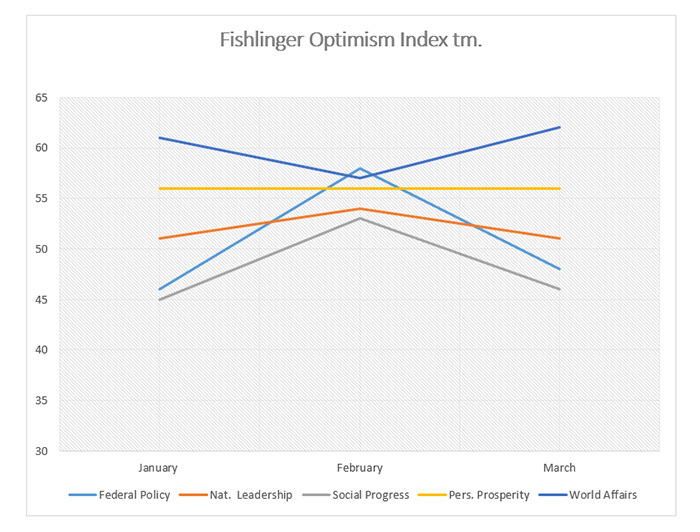 In measuring national leadership, Fishlinger Optimism Index™ assesses public expectations for the effectiveness of federal policy and quality of governance both domestically and in global affairs. Social progress examines the potential for progressive reform. Personal prosperity explores individuals’ sense of achievement and economic stability. In this study, the Fishlinger Center conducted online national surveys focusing on political issues in the United States. The fieldwork for the poll was conducted using a blended national panel form Survey Sampling, Inc. Interviews were conducted March 4-28, 2019. The credibility interval for 1,000 respondents is plus or minus four percentage points. The credibility interval is larger for subgroups and for differences between polls.